We recommend checking out our discussion threads on the Areca ARC-8050T2 8-Bay Thunderbolt 2 RAID Enclosure ARC-8050T2, which address similar problems with connecting and setting up Hard Drive Enclosures & Docks Areca. The user manual for the Areca ARC-8050T2 8-Bay Thunderbolt 2 RAID Enclosure ARC-8050T2 provides necessary instructions for the proper use of the product Computers & Solutions - Drives & Storage - Hard Drive Enclosures & Docks. The ARC-8050T2 8-Bay Thunderbolt 2 RAID Enclosure from Areca is an 8-bay enclosure that is capable of holding both 2.5" and 3.5" SAS and SATA 6 Gb/s hard drives and solid state drives. The back of the enclosure features two 20 Gb/s Thunderbolt 2 ports allowing you to connect the enclosure to computers running Mac 10.8.5 or higher and computers running either Windows 7 or Windows 8. Once connected, you benefit from enhanced Thunderbolt 2 connectivity and the ability to daisy-chain up to six compatible peripheral devices. This eight bay Areca Thunderbolt RAID enclosure also comes with extensive RAID level compatibility. Whether you are looking for speed or redundancy, you can configure the drives to suit your needs as the enclosure supports a variety of RAID levels including RAID 0,1, 1E, 3, 5, 6, 10, 30, 50, 60, Single Disk, or JBOD. 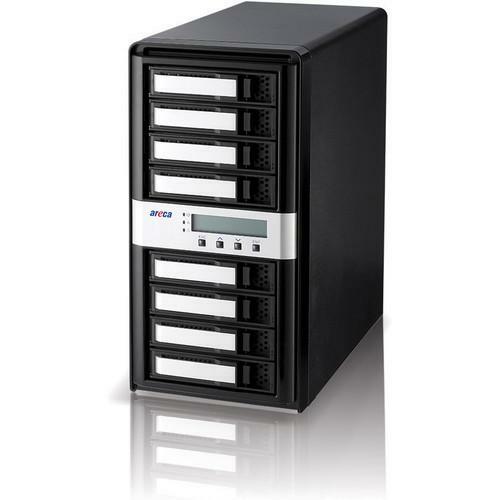 To back up the enhanced connectivity and advanced RAID features, this Areca enclosure comes equipped with an 800 MHz dual core ROC for RAID core and SAS microcode. Along with the enhanced processing power, you benefit from 1GB of on-board DDR3-1333 SDRAM to ensure smooth operation when working with data intensive applications. Additionally, this enclosure can be monitored through a variety of methods including via the front facing LCD, the LAN port, or via the Thunderbolt 2 port. Please note drives sold separately. If you own a Areca hard drive enclosures & docks and have a user manual in electronic form, you can upload it to this website using the link on the right side of the screen. Box Dimensions (LxWxH) 15.3 x 13.9 x 7.5"
The user manual for the Areca ARC-8050T2 8-Bay Thunderbolt 2 RAID Enclosure ARC-8050T2 can be downloaded in .pdf format if it did not come with your new hard drive enclosures & docks, although the seller is required to supply one. It is also quite common that customers throw out the user manual with the box, or put the CD away somewhere and then can’t find it. 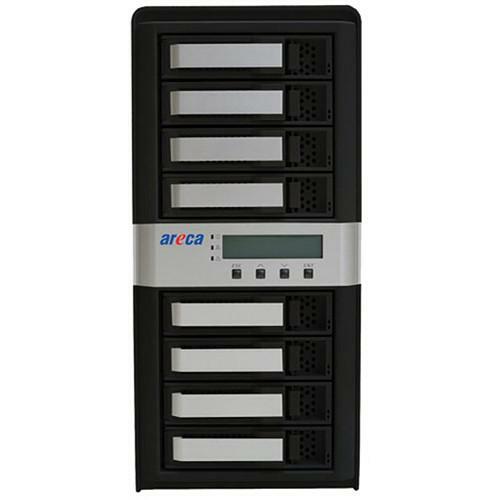 That’s why we and other Areca users keep a unique electronic library for Areca hard drive enclosures & dockss, where you can use our link to download the user manual for the Areca ARC-8050T2 8-Bay Thunderbolt 2 RAID Enclosure ARC-8050T2. The user manual lists all of the functions of the Areca ARC-8050T2 8-Bay Thunderbolt 2 RAID Enclosure ARC-8050T2, all the basic and advanced features and tells you how to use the hard drive enclosures & docks. The manual also provides troubleshooting for common problems. Even greater detail is provided by the service manual, which is not typically shipped with the product, but which can often be downloaded from Areca service. If you want to help expand our database, you can upload a link to this website to download a user manual or service manual, ideally in .pdf format. These pages are created by you – users of the Areca ARC-8050T2 8-Bay Thunderbolt 2 RAID Enclosure ARC-8050T2. User manuals are also available on the Areca website under Computers & Solutions - Drives & Storage - Hard Drive Enclosures & Docks.